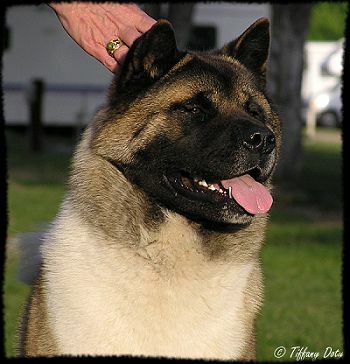 We believe Merit holds true Akita type with her small forward set ears, her deep dark almond shaped eyes, black pigment and her beautiful headpiece that forms a series of triangles. Merit has a strong and sound rear with her flowing side gait that will take your breath away. I n June 2004 Merit took Back-Back-Back 5-Point Majors to become a New Champion just as her sire Cowboy did! Merit nows has her ROMPX, which she is so deserving of. She has produced 10 Champions with more to come! She was spayed in the Summer and she is now the matriarch of her domain, and she doesn't let us forget it! Click on smaller images to view the larger image. 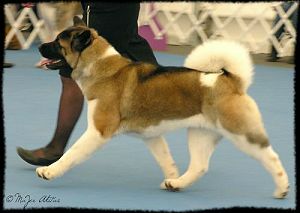 © COPYRIGHT 2000-2018 CROWN ROYAL AKITAS. ALL RIGHTS RESERVED NOT AVAILABLE FOR REPRODUCTION.